You can’t change your past but you can certainly change your future. When Jay learned to ski at age 65, he was a man with a mission to change his life. He wanted to be the grandfather with the kids out on the slopes creating memories. Learning to ski at his age isn’t for the faint of heart. It’s counterintuitive. To gain control you have to do the opposite of what your instincts tell you, lean your body straight downhill. After 65 years of life experience, you aren’t as fearless as you were as a kid. Strains, sprains, and bruises hurt; you want to avoid injury. You love the feel of the wind in your hair, so controlled speed is great. However, you want to avoid a wrong turn onto a steep black diamond run that you have no business taking. Jay pressed on and overcame all those fears so he could be granted one simple wish. He wanted to ski with his granddaughter. His dream just came true. Norah (age 7) just learned how to break out of the wedge and ski parallel turns. Jay didn’t hear about it later; he got to see her first parallel turns with his own eyes as he skied behind her. She chose me first, then her, then her mother and then her grandfather. You see, she wanted them to watch her. She’d had a Reindeer Club lesson the day before and learned new skills. With me first-in-line as leader and trailblazer, Norah focused on her form and her Mom and Grandfather observed her newfound skills. To our delight, her skis stayed (mostly) parallel as she executed nice, wide S-turns over and over again. All of his hard work paid off. Do you ski with your grandchildren? What memories have you created from your adventures? We started skiing when our oldest child was 6. It quickly became a family sport. As the years passed it became a passion for our son. He started his ski career at our local resort Bogus Basin. In his second season at Bogus, they closed early due to lack of snow and several instructors took Deer Valley up on an offer to finish the season at DV. He never returned to Bogus, he has been at Deer Valley ever since. We skiied DV in December 2006 for the first time and have been back every year since. The third generation skiied for the first time at Deer Valley at 20 months. He is now 5 and can’t wait to travel down to Deer Valley in March to visit and ski with his Uncle Chris. Skiing together as a family has been priceless to me. P.S. Be careful what you teach your children, it could become their career! My husband, Bob took up skiing again this year after a bear 25 year hiatus. He is skiing DV as often as possible. He particularly enjoyed – just this past Sunday- skiing with our son and 5 year old granddaughter. And let’s just say Bob is a couple years older than Jay! We have always had an amazing experience at Deer Valley! 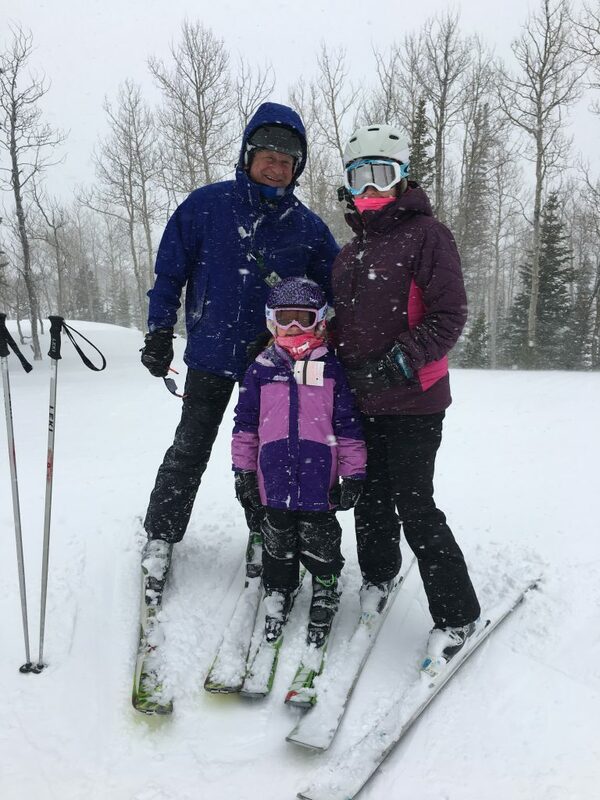 Norah is a natural and was thrilled to be able to ski with her “Gramper”, Jay, and her “Noni”, Nancy. She learned so much this year! What a great family tradition!!! 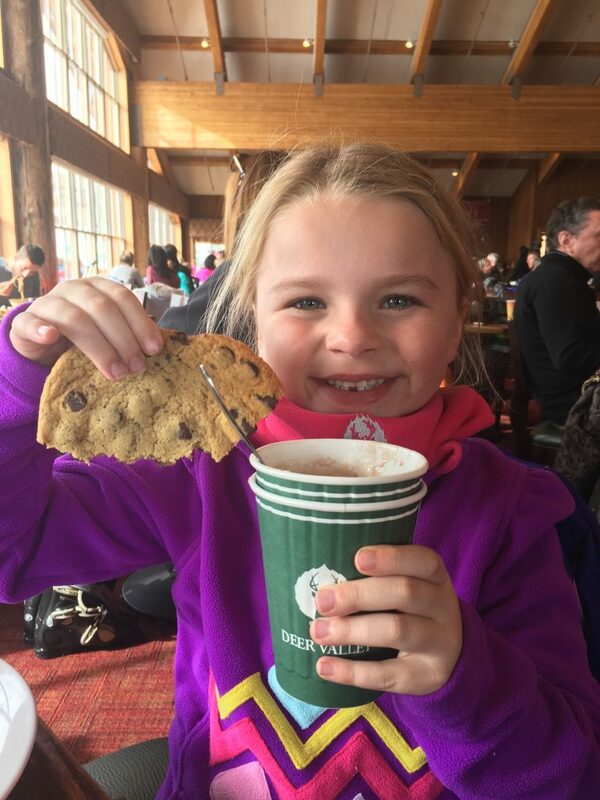 What a wonderful ski experience with your granddaughter. It sounds like the ski lessons were worth the investment. Did she take a group or private lesson? How about that chocolate chip cookie? Did she share the other half!? It sounds like your third generation learned to ski about the same time he learned to walk! So happy to hear skiing together is priceless to you. Our family feels exactly the same way. Norah took a group lesson on a Friday and then skied with us for the next two days. It worked out really well! Last year, she did three days of lessons and it gave her a great base. She really improved. As far as the massive cookie goes, she ate the entire thing all by herself. When grandparents are around, no sharing is required! I love the story and the photos. 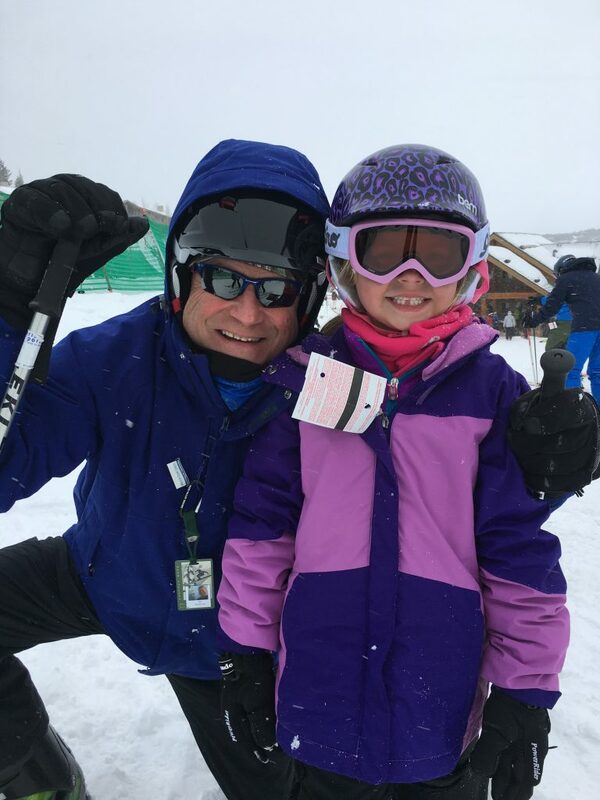 Gary and I can’t wait to ski with our grandkids…next ski season! !